At DiveBuzz, we are self confessed dive addicts. That is why, when we part with our hard earned cash, we want to get the most out of our diving, wherever we may be. Having just returned back from another dive trip to the famous Tulamben, in Bali, we can vouch for the fact that this place is a good as ever. In fact, we’ll go one step further and state that it is actually BETTER than the last time we visited! Now let’s face it, dive locations as popular as Tulamben rarely improve with time. Whilst the locals have a vested interest in protecting the area’s underwater assets, the simple truth is that careless dive practices, the impacts of weather and time on Tulamben’s famous wreck the USAT Liberty, fishing, global warming and tourism are all likely to have an impact on the area’s underwater diversity. Indeed, we did see some impacts of this on our latest visit: high seas the previous week had collapsed the cannon on the wreck, and most notably, the famous schooling jacks which we have captured so many times before, were absent. We were advised that the jacks had been absent for over a year and it was “unknown” where they had gone or what had happened. So with this in mind, why are we saying that the area was better than our last visit? Quite simply, we saw so many more critters than on our previous visit and this is in every aspect, a direct result of our fabulous dive guide, Nyoman, from Tulamben Wreck Divers. We have dived with Tulamben Wreck Divers on a number of occasions previously and would thoroughly recommend them to anyone. Owned by Tony Medcraft, who pioneered the whale shark spotter planes for snorkelling trips in Western Australia’s Ningaloo Reef, in partnership with local Wayan Ambek. The shop offers great dive accommodations in 3 locations from ocean front villas to clean and comfortable accommodation behind the dive shop or Wayan’s restaurant. Nyoman, and in fact all of the guides at Tulamben Wreck Divers, know the sites like the back of their hands. They are all local guides. They have all grown up in the area and have a vexed interest in protecting the areas assets. They all love working for Tony, he is a fair leader who compensates them for their superior skills and loyalty by paying a fair wage to his staff. The result of this simple equation is that all the dive guides are very experienced, local guides who are highly engaged. They know they have it good, they never leave! In Tulamben, as with all dive locations, the “big stuff” is hit and miss. Yes, you may see a shark, barracuda, bumphead parrotfish, mola mola or indeed the famous schooling jacks (if they return). But it is the big stuff that comes and goes, the small stuff tends to be more reliable and Tony instils in all of his local dive crew to always point out the small stuff. As a result, his team are renowned for their spotting skills. 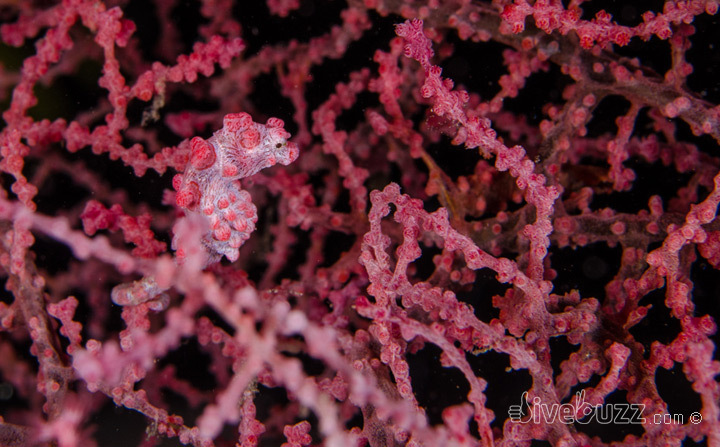 We completed 20 dives over 5 days on our latest stay this time and saw some critters that we have not previously seen. Nyoman clearly loved his macro and his skills and enthusiasm in spotting the sheer volume that he did even impressed big stuff addict J9! He would quite literally find the smallest of nudis, crabs, shrimps, camouflaged leafy scorpionfish, point out to us, allow us to shoot some images and by the time we (or more to the point, J9!) had had enough, the next creature was found ready to be pointed out to us! It was relentless! These spotting skills were nothing to do with luck, as we say, Nyoman knew the area like the back of his hand. He knew what he could find and where it would be and whilst we completed a number of our dives on the same site, no dive was ever the same. We always saw something new, something rare, something unique. The way that Nyoman guided and dived really highlighted how protective he was of the area. If other groups were in the vicinity, he would slyly look around to check none of them were looking before shyly pointing out his critter and moving on, to ensure he did not attract too much attention to the animal. He did not want all the guides to know where all the critters were. He did not want guides to take inexperienced divers to certain spots and damage delicate seafans and their inhabitants with their poor dive skills. We got the sense that as he got to know us and our skills more, he showed us more and more in his protective way. On one particular surface interval at the famous Seraya Secrets, Howard was scrolling through some of his images with Nyoman. A couple of the other guides came to investigate and view the images also. Each time a unique critter appeared on the screen, one of the guides would get very excited and ask Nyoman where that animal was. Nyoman would simply point out to the ocean and casually state “out there” as if it was a lucky find. The truth is, he knew exactly where that critter was and could take anyone back in a few fin kicks to find it! He just wanted to protect his brand, the brand of Tulamben Wreck Divers and of course the local area. On our previous visit to Tulamben, Tulamben Wreck Divers were fully booked and were unable to accommodate us. We ended up diving with another operator. The guides were not local, they simply did not have the knowledge and experience of the area and as a result, we ended up seeing a fraction of the amount of life that we did on our latest visit. This is why we say, a great dive guide is worth their weight in gold. We invest a lot of time and effort and hard earned cash into our diving and we want to get the most back in return for this investment. This was achieved this time. We will back back again to Tulamben, and specifically to dive with Tulamben Wreck Divers. 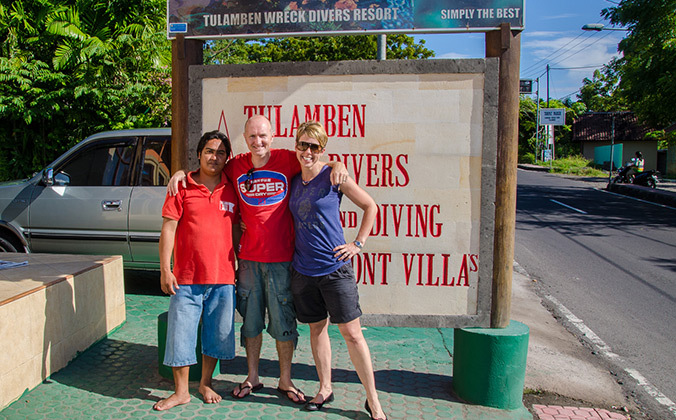 Thanks again to Nyoman, Tony, Wayan and the rest of the dedicated dive, accommodation and restaurant team. Do you have any great dive guide experiences you can share? Have you ever had a poor dive guide? We would love to hear your comments and more below.